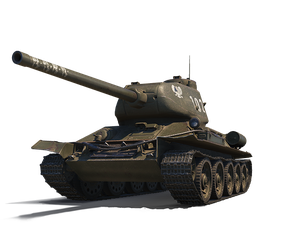 What tank collection would be complete without the T-34-85 Rudy? A fictional tank that was the star of a Polish TV show named "Four Tankmen and a Dog", the Rudy now rolls across World of Tanks battlefields, blowing up enemies with its 85mm main gun. The Rudy comes with 100% trained crew including man's best friend, a dog named Szarik. Not only that, they come with a free Brothers In Arms perk, meaning you start with high combat effectiveness! What do Premium Vehicles, Gold, Premium Time, and other Premium Goods do? Not familiar with Premium Vehicles, Gold, Credits, Premium Account Time, and Personal Reserves? This vehicle's crew comes with a free perk. This means that they get a perk to start off with, and the EXP requirement for the second perk is the same as that for earning the first perk. Take some time to earn more perks to improve your combat performance, and enjoy faster growth as compared to your other crews that may not come with free perks! Click on the bundle names below to display more information. This crew comes with a FREE Brothers In Arms perk. The EXP requirement for the next perk is the same as that for earning the first perk. Crew includes a cute and loyal dog.